Discover ULU After Hours! Urban Librarians Unite is taking the energy of its Urban Librarians Conference and spreading it out across the year in bi-monthly evening conversations about the best and brightest ideas in modern librarianship. Join us for cheap wine, adequate cheese, and great conversations. You can be the panelist! 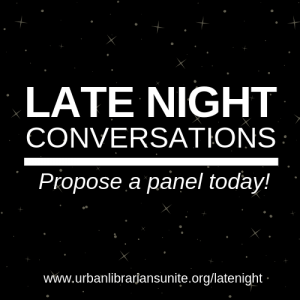 We will be explore deep issues in library science after dark with panels of experts from across the profession. These evening panels will be curated to be lively, spicy, and sometimes challenging and we need you to make it happen. Got an idea nobody else gets? We want to hear it. Have a new solution to an old problem? That’s our jam. Want to turn the entire profession on its ear and shake it awake to the challenges you see. Boy oh boy would we love that. This new effort by Urban Librarians Unite is our way of keeping the magic and excitement of our conference going year round. These bimonthly panels will meet around New York City (starting off) to do deep dives into topics you won’t see at other conference. We are wide open to your craziest and most radical ideas. Come up with a panel idea, reach out to others you know will dig in, and we will host it. The Conversations from the Night Library will be recorded and put out there as podcasts to spread the conversation even wider. We want to hear from you, so put in a proposal here!